Lorrin Andrews : Hawai'ian Dictionary, 1922. Bishop Museum, Honolulu, 1922 (Revised). In 1836 "A Vocabulary of Words in the Hawaiian Language" was published by Lorrin Andrews. The evident usefulness of this list of about 6000 words led its author to prepare "A Dictionary of the Hawaiian Language" which was issued in 1865. 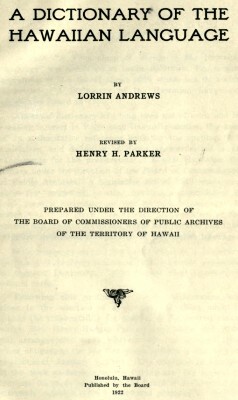 Andrews' dictionary had long been out of print and increasing interest in Polynesian linguistic studies, the need of an authoritative reference book for the spelling, pronunciation, and definition of Hawaiian words, led to arrangements for the preparation of a new Hawaiian dictionary under the direction of the Board of Commissioners of Public Archives. respective equivalents or meanings in the English language." As a necessary step in the preparation of a dictionary the Board of Archives transcribed all the words appearing in Andrews' Dictionary. These totaled about 15,000 type-written cards. Following this preliminary work consideration was given to the selection of a compiler on whom might be placed the responsibility for preparing the desired manuscript. Rev. Henry Hodges Parker was chosen and financial arrangements made whereby he was released from other obligations for the five years following the date of appointment, January 1, 1915.
tinguished Hawaiian scholar, Lorenzo Lyons (1807-1886) into the body of the original Andrews Dictionary, the revision of many definitions, the time-consuming task of supplying diacritical marks, the comparison of word lists from various sources (see pp. vi and vii). Particular effort was made to insure correct separation into syllables of the words defined, and to insure correct spelling of Hawaiian words, phrases and quotations. Early in 1921 the manuscript cards were transmitted by the Board of Archives to the Bishop Museum, which consented to do the editorial work necessary to prepare the volume for the press. The Museum staff verified many scientific terms, compiled a list of Hawaiian geographic terms, and with the assistance of J. S. Emerson, Stephen Mahaulu, and other Hawaiian scholars, added a few words and enlarged and clarified many definitions. Galley proof has been read by Mr. Parker. The Board is under obligation to the Bishop Museum for skilled assistance and for financial aid which has permitted the publication of the dictionary without further drafts on Territorial funds. Board of Commissioners of Public Archives. Limi (li'-mi), v. To be entangled or be in difficulty in the surf; to be upset in the surf and turned over and over. To be overwhelmed in water. Lula (lu'-la'), adj. 1. Smooth, as the surface of the sea unruffled by the wind. Lumaia (lu'-ma'i-a), v. [Contraction of lumaiia, passive of lumai,] To be entangled or turned over and over by the surf; e lauwiliia, limi- limiia e ka nalu. Maewa (ma'-e'-wa), v. [Ma and ewa, to be bent out of shape.] 3. To be blown here and there, as the spray of the surf by the wind; e hoopuehuia e ka wai. Maleno (ma'-le'-no), n. Same as malino. Calm, as the surface of water; smooth. 1. A great perturbation of the sea, wind and current contrary. Manono (ma'-n6'-no), n. 1. The sea as the surf dashes against the rocks; o kekaikuihala kui manono. Manu (ma'-nu), n. 3. The upward-projecting pieces on the two ends of a canoe, distinguished by the words mua and hope, as manu mua and manu hope, fore and aft. Miomio (mi'-6-mI'-o), n. An aquatic sport; riding the surf without a surf-board ; body surfing. Miomio (mi'-6-mi'-o), v. [MIo, to dive.] 1. To dive in the water. 2. To be tapered. Moana (m5'-a'-na), v. 1. To be spread out; to be spread over, as the sea at high tide. 2. To be far below the surface of the sea. Mouo (mo-u'-o), n. 1. A buoy; a float to show something below the water, as an anchor. 2. A piece of wood, board or other substance to float on; o ka mouo e ou ai ka naau, a buoy for the heart to escape on. 3. A place where anything may float securely, like the poe heenalu when they come in through the surf and float at ease. Nakolo (na-ko'-lo), n. Echo; a reverberating sound, as the undertone of distant thunder or breaking surf. Nalu (na'-lu), adj. Roaring; surging; rolling in, as the surf of the sea. Nalunalu (na'-lu-na'-lu), adj. [Nalu, surf.] Roaring, as a high surf; appearing rough, as a high surf or high sea. Nalu (na'-lu), n. 1. The surf as it rolls in upon the beach; a sea; a wave; a billow. Niania (nl'-a-ni-a), n. A smooth surface; a calm and smooth surface on the sea or anywhere else. Oia (o'-i-a), v. To submerge; He oia ka mea hawawa i ka heenalu, the unskillful surf rider plunges under water. Olo (o'lo), n. [Olo, to rub up and down.] 1. A saw, from its motion: pahi olo, a saw. 2. A double or fleshy skin; the moving flesh of a fat animal. 3. The wattle of a turkey. 4. A very thick surf-board made of the wiliwili tree. Laieik. p. 90. 5. A loud wailing; a lamentation; makena. Syn: Pihe. Omoki (o-mo'-ki), v. 1. To stop up with a cork, bung or stopper: ua paa i ka moklia i ka pani. 2. To drop suddenly into deep water in such manner as to cause but slight disturbance on the surface; a sport for children: omoki lua ka wai o ke keiki akamai i ka lelekawa. Syn: Umoki, iamo. Onalunalu (o-na'-Iu-na'-lu), n. [Nalu, surf.] A ruffled sea; white, broken water on the surface of the sea. wind when it covers the sea with ripples: he onini makani; the first beginning of a sea breeze; a puff of wind. 2. One of imperfect vision when trying to read; onini ke kanaka i ka ili wai; a cross-eyed person. 3. A kind of surf-board, very difficult to manage and used only by experts in surf-riding. Onu (o-nu'), n, 1. A swelling; a wen on the neck or head; a dilating; expansion. 2. An enlarging or swelling of a physical organ. 3. A protuberance; a hillock; a slight rising on the surface of either land or water; a swell. 2. The sound of surf; of a ship passing through water, of an army at a distance; the murmur of water. owill, a koi (ax) made gougelike for working the inside of canoes. 2. A very thick surf-board made of wiliwili wood. Paeee (pa'-e'-e'e), n. [Pae, to support.] 1. A lying down upon, as one lies down on his surf-board to swim. Paepu (pa-e'-pu'), n. [Pae, to strike, as a sound, and pu, together.] The deafening roar of the surf. 2. A surf board; he papa heenalu. Pahee (pa-he'e), adj. Smoothed; polished; slippery; shining, as a polished surface; smooth, as a person without hair. Pahee (pa'-he'e), n. 1. A game which consists in sliding on a stick or board. 2. A sliding on any smooth surface. Pahiahia (pa-hi'a-hi'a), v. [Pahia, to slide.] To slip; to slide; to fall down in a sliding manner; to slip down; to fall feet foremost. Paka (pa'-ka'), v. 1. To cut at random; to cut in long slits. 2. To ride the surf with a canoe. 3. To turn, shoot or slide, as a surf-board or canoe. Pakaka (pa'-ka'-ka'), v. 1. To glide with a canoe on the surf; to ride on the surf. 2. To flow off; to turn off, as a canoe is turned to avoid a sea; to shoot or slide, as a surf-board on a wave: e pakaka i, ka waa, to steer the canoe. Palala (pa'-la'-la), v. To break on one side or break in parts, said of a breaking surf or wave; e haki lala ka nalu, e, i hookahi aoao. Papa (pa'-pa), n. 1. A word applied in general to any flat surface. Papakai (pa'-pa-ka'i), n. A narrow escape of a canoe landing in the surf. Pauliuli (pa'-ti-li-u-li), adj. Dark blue, as the sky in the evening near the horizon, one of the signs of a high surf (kaikoo). Poana (po-a'-na), n. The name of the sea outside of where the surf breaks; also called pueone. pot or other vessel. Puk. 25:29. 3. The top of a curling surf where it breaks: he wahi e haki iho ai ka nalu. Poi (po'i), V. 1. To cover; to shut, as in closing any container with a lid; to bring two parts together to protect or hold what is between. 2. To curve and break over as a high surf. 3. To fall suddenly upon and seize, as a bird of prey: Ke poi nei ka nalu, the surf is breaking. E poi ka umeke, cover the calabash. Poipu (po'i-pu'), adj. Covered or buried up, as one overwhelmed with waves or the surf: Iloko o ka halehale poipu o ka nalu. Popoi (po-po'i), n. 1. A bung; a stopper for any orifice. 2. The action of the surf on approaching the shore, when it rises high and breaks with roaring noises; combing of the surf. Pueone (pu'e-o'-ne), n. The place in the sea outside of where the surf breaks; also called poana kai. 5. The motion of the hand in starting a surf-board on its run from the crest of a wave. Syn: Kioe. Punakea (pu'-na-ke'-a), n. The white coral that a high surf throws up on the beach: ku ka punakea iuka. Hainalu (ha'i-na'lu) : broken surf. Kainalu (ka'i-na'lu) : surf. Land section, Kona, Molokai. Pakaka (pa'-ka-ka') : to glide as on the surf. Land section, Oahu. Geoff Cater (2013) : Lorrin Andrews : Papa Heenalu, 1865-1922.